Very nice Gary. I look forward to seeing this beauty in person. Very good job, he looks so real! 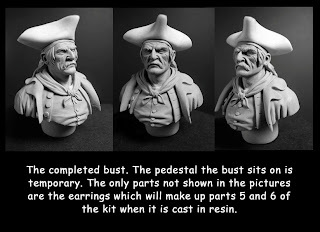 This is really great sculpting. I like the face! Great quality. Wow, I'm impressed! I just started to paint miniatures. I have a project coming up where I'm going to have to do some cannibalizing of figures to create one and have no idea how it will work. Going to have to do some sculpting and I'm no artist, just a retired photojournalist.